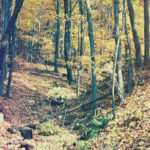 Fern Hollow consists of wooded slopes, trails, spring seeps, and tributaries to Little Sewickley Creek, a “Medium-Gradient Clearwater Creek Community” as defined by the Allegheny County Natural Heritage Inventory (ACNHI). The property is surrounded by public property and has frontage on Fern Hollow and Hallaway Roads, which provide access to Sewickley Heights Park. The property and surrounding park have abundant plant and wildlife that are the focus of a year-round ecological study. Several trails exist on the property and connect the extensive trail system of Sewickley Heights Park. The trails are used for horseback riding by the historic Sewickley Hunt and other locals; others take leisurely walks or invigorating runs to reconnect with the land. Hunting on this property is managed by the Whitetail Management Associates. Contact bohunter28@comcast.net for more information. We ask that hunters read our Hunting Policy, and apply for a free permit before hunting on any conservation area. Fern Hollow is located within the Camp Meeting Woods Biological Diversity Area (BDA), which has been ranked “Exceptional Significance” and contains two occurrences of State Significance; NC001, State Significance S3; and NC002, State Significance S2. The property was listed and being actively marketed when ALT was approached and encouraged by the community to purchase it. Several developers were interested in the property due to its location and proximity to local and regional amenities. The 33.6 acres could accommodate several housing sites, which if constructed, would have had a significant negative environmental and aesthetic impact on Fern Hollow due to the steep terrain. A large area would need to be cleared and graded to create level building pads for homes, driveways, etc. Construction would have destabilized the moist wooded slopes and degraded the water quality of Little Sewickley Creek with erosion. Landscaping for new homes could have introduced exotic and invasive species into the ecosystem, and lawn care could have introduced harmful chemical fertilizers, herbicides and pesticides into the soil and watercourses of the BDA. Allegheny Land Trust is happy to have acquired the green space, and is committed to preserving it for future generations to enjoy. Park wildflower blooming season and bird lists are available for visitors at Fern Hollow Nature Center, a place where individuals, groups and families can come to enjoy the outdoors. Learn about the hunting policies for this and other ALT conservation areas.